Designing a custom home with Cogdill Builders, custom home builders Central Florida, means that you get the personalized details and designs you want every time. When you use one of our professional home designers you can employ the latest trends in the construction. One of the most popular rooms to customize when building your home is the bathroom. This room is considered a retreat, a getaway, and a relaxation spot. 8 Bathroom Trends From Our Custom Home Builders Central Florida. Negative Edge BathTubs are bathtubs where the framing of the tub slightly exceeds the height of the actual tub. This creates a sleek, modern appearance with sharper and more defined edges instead of the softer edging we are used to seeing on bathtubs. Luxury Showers are also becoming very popular. 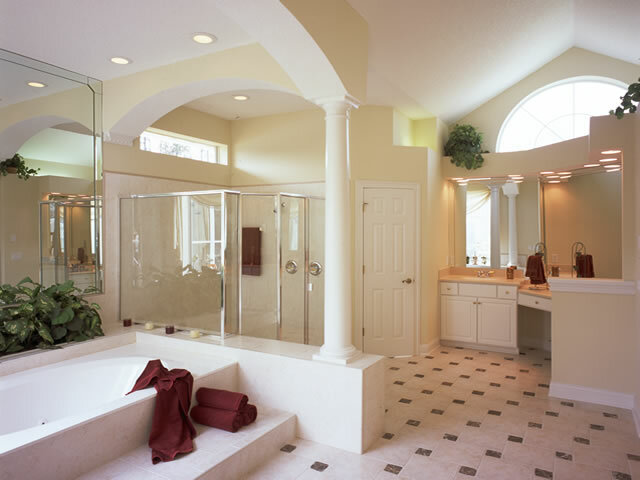 Many are choosing over-sized shower heads, rainfall showers, or dual head showers. The idea is to create a luxury escape similar to that formerly associated with taking a bath- but in a more eco-friendly way. Unique Mirrors are making a statement for bathrooms and taking the place of the traditional medicine cabinet. People are keeping the flat wall and adding a fun, funky mirror to enhance their space. A statement mirror will enhance the decor of your bathroom and create a more elegant presence and design. For storage, deeper vanity drawers are the style. Prints and Textures for the walls are an emerging trend that are hitting all the major design blogs and publications lately. The effect is outstanding. Instead of basic walls and tile backdrops, designers are using strong prints and textured walls to make a bold visual impact. Grout as an Accent makes the tile pop, and adds a unique design to your bathroom tile when using tile backdrops. Homeowners and designers are turning to grout as an accent to tile, rather than just a functional tool. Living room lighting is a common theme as well. Gone are the days of the cold, harsh bathroom. Now, light fixtures with a little more style are making the bathroom a little more home-like. Chandeliers are making a popular appearance, and in larger bathrooms, standing lamps. Televisions in the bathroom allow the homeowner to linger. Due to the extended period of time being spent and the larger aspects of creating this luxury space, larger bathrooms are the major theme. Whirlpool Tubs are creating a spa like environment for bathrooms. This trend has developed into the idea of adding entertainment to your bathroom. 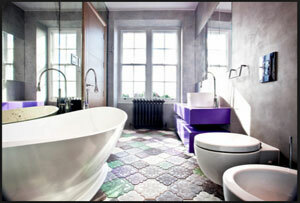 People are spending more time in their bathrooms and enjoying the space as a relaxation getaway. At Cogdill, our custom home builders Central Florida, can create large, luxury bathrooms in smaller, efficient homes due to our custom design process. Utilizing the space in your home is the key to everlasting comfort and efficiency for your lifestyle. At Cogdill Home Builders, we help you create the home that will best fit your needs, without sacrificing design. Sit down with one of our designers to start building your dream home. We are currently building in the vicinity of Tampa Bay, Pinellas County, Hillsborough County, Pasco County, Hernando County, Manatee County, Polk County, and Surrounding areas (within about an hr from Tampa).